Man City will be aiming to pull off a memorable comeback when they host Liverpool for Tuesday's Champions League quarter-final second leg. Will the Citizens overturn the 3-0 first leg deficit? 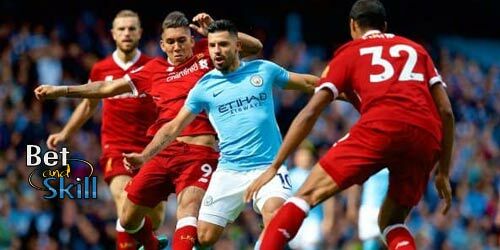 This article contains our Manchester City vs Liverpool betting preview with predictions, expert tips, probable lineups, team news, enhanced odds, betting bonsues and no deposit free bets on all the UCL quarter finals! 25/1 A Yellow Card in Man City v Liverpool! Coral offer 25/1 ANY Yellow Card to be shown in Man City vs Liverpool in Champions League + £5 free bet! Manchester City face an uphill battle to reach the semi-finals of the Champions League as they suffered a 3-0 defeat at Anfield Road in last week's first leg match. Since then, the Citizens suffered a further blow, losing a Premier League match 3-2 at home to Manchester UTD on Saturday, a game they led 2-0 at half time. It means that Man City have lost successive matches for the first time under Pep Guardiola and conceded three goals in each game. Anyway, Manchester City have scored three or more goals in over half of their 23 home games so far and have already beaten Liverpool 5-0 earlier this season. Kevin De Bruyne and Kyle Walker will return to the starting XI after being rested in the Manchester Derby. Sergio Aguero returned from his knee injury at the end of that match and is expected to lead the line, with Leroy Sanè and Raheem Sterling on his flanks. In defense, Fabian Delph and Danilo are in contention to start after Aymeric Laporte failed to impress in the first-leg. Kevin De Bruyne will replace Ilkay Gundogan in midfield, despite the German scored a goal in the derby. David Silva and Fernandinho will retain their starting berth in the middle of the park. Since the first leg Liverpool drew a league game 0-0 away at Everton and they remain third in the standings, 10 points clear of fifth placed Chelsea. The Reds have won three and lost none of their five away matches in Champions League this year. Jurgen Klopp's men have kept a clean sheet in 6 of their last 7 European matches. Furthermore, only four teams have stopped the Reds scoring away from home so far. Man City need to win by 4 goals should Liverpool find the back of the net at Etihad Stadium. Adam Lallana and Emre Can are out through injury while Jordan Henderson is suspended. As a result, Jurgen Klopp can only rely upon Georgino Wijnaldum, James Milner and Alex Oxlade-Chamberlain in midfield. Mohamed Salah was not risked in the Merseyside derby but the Egyptian is expected to recover in time from a groin injury suffered in last week's first leg. Sadio Manè and Roberto Firmino will complete the front trio, with Dominic Solanke and Danny Ings as backup options. Andrew Robertson and Trent Alexander-Arnold will also return to the starting defensive pack, play at each side of the central pair formed by Dejan Lovren and Virgil Van Dijk. The likes of Joe Gomez and Joel Matip are sidelined while Alberto Moreno is a major doubt. 25/1 ANY GOAL in Man City v Liverpool! Ladbrokes offer 25/1 a GOAL to be scored in Manchester City v Liverpool + £5 free bet! BetAndSkill compare odds from more than 70 top betting sites to select the highest prices on every match we preview. The following are the best odds on the Manchester City vs Liverpool match winner market (90 minutes only)! Don't miss your chance to bet on your favorutie team at bigger prices! Visit our Today's enhanced offers section! BetAndSkill professional tipsters have analysed all the details that can influence the outcome of this match and have published 5 betting tips on Man City vs Liverpool. Feel free to copy our predictions and bet them as singles! You can also combine many or all of the recommended bets using on of our suggested Request a Bet services. Don't miss our much appreciated betting tips on today's football matches! Plus, visit our Champions League predictions section! Get 25/1 Liverpool to qualify vs Manchester City with Betfair! New Customers can get Liverpool at an enhanced 25/1 to qualify vs Man City. Max Stake £1. Winnings paid in free bets, valid for 7 days, only deposits with cards/Paypal count. Exchange and multiple bets excluded. T&C’s Apply. 18+|Gamble Aware. Get 25/1 Liverpool to qualify for the Champions League semifinals with Paddy Power! Customers can get Liverpool at an enhanced 25/1 to qualify vs Man City. Max Stake £1. Winnings paid in free bets, valid for 7 days, only deposits with cards/Paypal count. Exchange and multiple bets excluded. T&C’s Apply. 18+|Gamble Aware. "Man City vs Liverpool 2nd leg predictions, betting tips, lineups and odds (Champions League - 10.4.2018)"